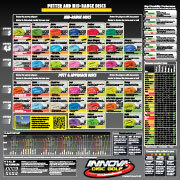 The best way to determine how any of Innova's disc golf discs will fly for you is to have a starting point. If you have already thrown an Innova disc, you'll be able to relate your experience to Innova's disc ratings, and then use those ratings to determine how other discs will fly for you. FLIGHT RATINGS - Each of Innova's disc golf discs has a distinct "personality" - the flight characteristics that make the golf disc unique. These Flight Characteristics describe a disc's Speed, Glide, High Speed Turn, and Low Speed Fade. Each category is given a numeric Rating. Once you have thrown one disc model, you can use these flight rating numbers to compare it to any other disc model. Flight ratings are based on a right handed backhand throw (RHBH). See Throw Charts by Dave Dunipace below. Speed is the ability of a disc to cut through the air. Speed ratings are listed from 1-13. Discs with higher numbers are faster. Altho faster discs go farther into the wind with less effort, they require more power to achieve their potential. Slower discs with lower numbers offer better distance control, take more power to throw far, and have less chance to fly past the target. Glide describes the ability of a disc to maintain loft during flight. Ratings are from 1-7 with 7 having the most glide. The higher the number, the better a disc can ride the air, especially downwind. 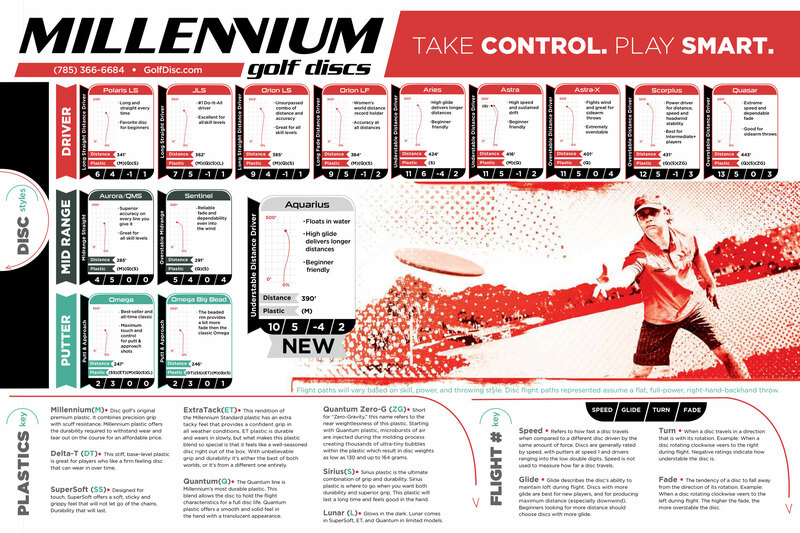 Beginners looking for more distance should choose discs with more glide. High Speed Turn refers to the initial part of the flight when a disc has a tendency to turn or bank to the right for right handed back hand (RHBH) throwers, left for LHBH thrower. Ratings are from -5 to +1. A disc with a -5 rating will turn the easiest while a +1 rating is most resistant to turning. Disc rated -5 to -2 make good roller discs. Low Speed Fade Refers to the end of the flight. All discs tail off or hook to the left for right handed back hand (RHBH) throwers, right for LHBH throwers, but some will hook harder than others. Ratings go from 0 to 5 with 0 meaning almost no fade (a disc rated 0 will finish straightest with the least fade) while a disc rated 5 will fade or hook hardest at the end of the flight. Discs with a high fade rating are predictable even in wind. 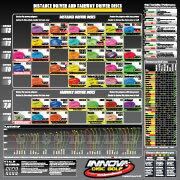 NOTE: Innova's flight ratings are not meant to describe the exact flight of any disc model. They are to be used to compare models. For instance, a Wraith at 11, 5, -1, 3 is a faster type than the 10 speed models and slower than the 12 and 13 speed models. The Glide, Turn, and Fade cannot be compared to other speeds, but can be compared to other discs at the same speed. This way the Wraith can be compared to an Archon, TeeRex and Max in the same line of plastic. STABILITY - describes a disc’s overall flight path. Understable describes the overall flight path as one that turns right during the high speed portion of the flight for a RHBH throw, left for a LHBH throw. Understable discs are much more speed sensitive than stable or overstable discs. Understable discs thrown with more zing will curve more to the right than discs thrown with less zing. Therefore an understable disc will often fly stable to overstable at low speed. They are beginner friendly as beginners tend to throw discs at lower speeds. Read more about Turn and Fade above. Stable describes a flight path that is basically straight and hardly turns. Overstable describes the overall flight path as one that turns left at high or low speeds for a right handed back hand (RHBH) throw. It would turn right for a left handed back hand (LHBH) throw. Best used against the wind and by players with lots of power. Read more about Turn and Fade above. HYZER and ANHYZER - refer to the bank angle of the disc at release. Hyzer is the angle of release where the outside edge or left edge of the disc is tilted downward for a right hand back hand (RHBH) thrower. A disc throw with hyzer will turn left more quickly than one thrown flat. If you are trying to get your disc to go sharper to the left, throw it with more hyzer (RHBH). A disc thrown with more power and more hyzer will go sharper left. Anhyzer is the angle of release where the outside edge or left edge of the disc is tilted upward for a RHBH thrower. A stable or overstable disc thrown with anhyzer will make an "S" curve and end up straighter or more to the right depending on the stability of the disc and the degree of the anhyzer release. If you are trying to get your disc to go to the right, throw it with more anhyzer (RHBH). These angles are reversed for left hand back hand throwers or right hand sidearm throws. PITCH - refers to the nose up angle with which a disc is released. Drivers are more pitch sensitive than Multi-purpose or Putt & Approach discs. 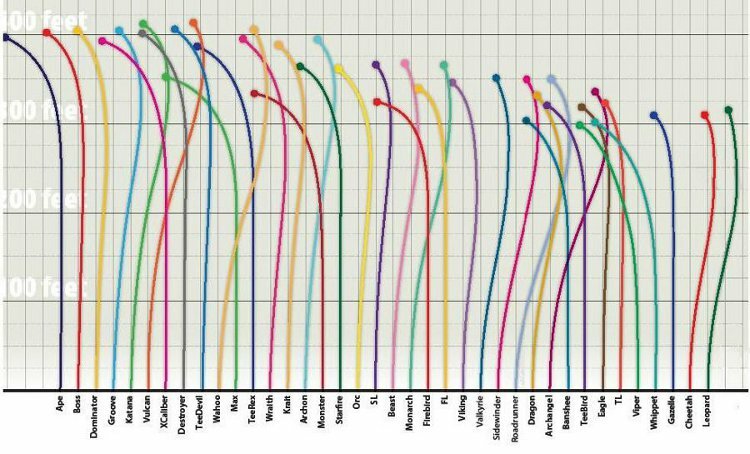 Drivers thrown “nose up” or with an upward pitch will appear to fly more stable to overstable than they are actually rated. Beginning disc golfers tend to throw “nose up” shots. THE AFFECTS OF DIFFERENT PLASTICS - The exact flight for any model is dependent on the particular material with which it is made, such as DX, Pro, R-Pro, Champion or Star. It is also dependent on the thrower's style and speed. Champion plastic tends to produce the most high speed stable discs (other than special runs of Star Lite), followed by Star, DX, Pro, and R-Pro. The disc ratings are an average for the different types of plastics, although the ratings most closely resemble the flight characteristics of the Champion plastic. Champion and Star will retain their flight ratings characteristics for a longer period of time. Pro will start slightly less overstable and the driver models will have more glide. DX will start more overstable and with use will match the ratings. With continued use, the DX will eventually become more understable than the ratings. For more info on plastics, see Plastics Comparison.